From 12 to 16 April 2016, in the occasion of the international conference "Bramosia dell’Ignoto | Greed of the Unknown" at the Italian Cultural Institute of Prague, will be hold a retrospective of Enrico Magnani entitled "Magnum Opus". The exhibition brings together a selection of works from 2007 to the present day. The collection covers all of the issues with which Magnani, in the last decade, has been exploring the most ancient spiritual traditions of humanity. Artworks always inspired by the great themes: from Alchemy to Taoism, from primitive archetypal to Greek mythology. With stones, metals, clays, and combustions the symbolism of labyrinths, of tao, of the five elements, and the philosopher's stone takes life, gathered here to invite the viewer to explore the depths of his being and better understand the meaning of life and its role in the universe. With the Patronage of the Italian Institute of Culture and the University Charls IV of Prague, Italia Arte and MIIT Museum Turin. Exhibition catalogue by Italia Arte Edizioni. "Bramosia dell'Ignoto | Greed of the Unknown"
Esotericism, occultism and fantasy in Italian Literature from the fin de siècle to avant-garde”. In the period between the late nineteenth and early twentieth century, after the wave of great positivist belief in reason, a logical crisis of rationality started, which affected the entire way of thinking in Western society. Fin de siécle literature, including the Italian exponents, was also strongly affected by it. Writers started exploring an untouched occult territory in search for knowledge that goes beyond the material world, beyond all that is evident, explainable or familiar, seduced by the desire to “chart the unknown”, which is partially present even in the works of realism Master, Giovanni Verga. The fact that even the major representatives of realism, foremost Luigi Capuana, haven’t remained immune to this trend, speaks volumes. On the literary scene (and in other forms of art) spirituality broke through as the rising protagonist, having replaced rationality and truth, until then considered to be an objective entity. This process of abandoning the certainties of the “old school” was accompanied by the decline of certain literary genres, such as realism for example, and the rise of others: first and foremost fantasy storytelling. The unified image of the “Little World of the Past” was crumbling, disintegrating in the same way as the psyche of the individual, giving way to the birth of character-man, with Debenedetti. From the traditional romantic theme of duality, from doubling the soul and/or body we get to the hundreds of thousands of identities of Pirandellian characters or man multiplied by futurists. Such an atmosphere established strong bonds between literature and esotericism, spiritualism and the so-called “occult”, a bond that in Italy, continued until the historical scene-setting for avant-garde and beyond. The relationship between literature and esotericism in particular, has been in the limelight in recent years thanks to rigorous studies, which have made it possible for us to see how the phenomenon came to be, and how important the analysis and deeper understanding of literary currents and of individual writers and their work is. This field of knowledge has become the subject of academic research in the last decades and for this reason the main focus of Convention will be on Italian authors, active in the years between the late nineteenth and the early twentieth century, whose life and/or work has been particularly affected by the influence of esoteric thinking and their fascination with the “occult”, as well as on those authors that have contributed to the development of fantasy genre in Italian literature, a genre which, even if often referred to as weak or “irregular” – spread crucial teachings throughout society, which due to their nature and characteristics, can be defined as “initiation”. Even if for Todorov the golden age of fantasy literature ends with the beginning of the new century, the aim of the Convention is to investigate the extent to which the changes from the beginning of the twentieth century (introduced by Freud, Einstein, Bergson…) have influenced further development of the fantasy genre in the Italian literature. 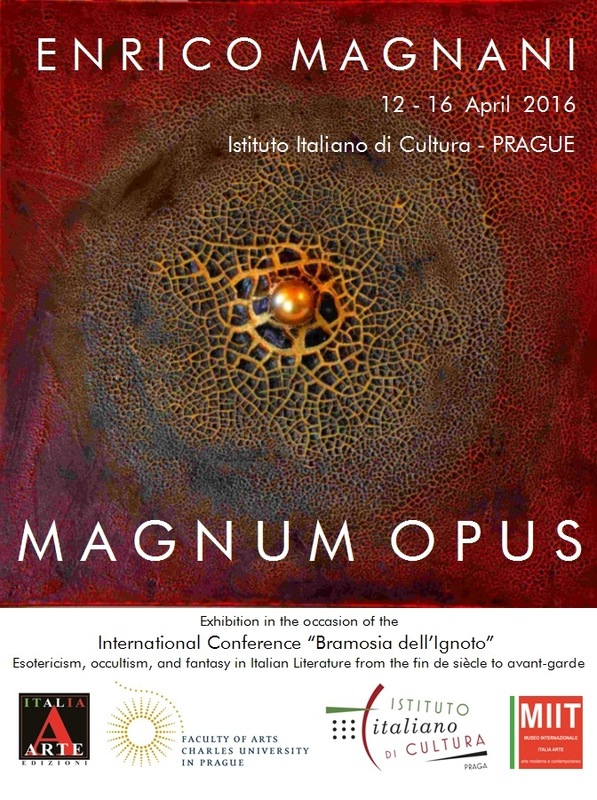 The Convention will take place in two parallel sessions on the 13th, 14th and 15th of April 2016. in the premises of the Italian Culture Institute in Prague (Šporkova 14 St. - 118 00 Praha 1 – Malá Strana). The closing ceremony will be held at the Faculty of Philosophy – Charles IV University (Nám. Jana Palacha 2 St, 116 38, Praha 1). The conference will be opened by prof. Marco Pasi (University of Amsterdam), prof. Simona Cigliana (Sapienza University, Rome) and prof. Antonio Saccone (University Federico II, Naples).